Polish and Charms: Twinsie Tuesday: Halloween! Hello! It's time for another round of Twinsie Tuesday! This week is our Halloween theme!!!! I might be cheating a little bit, but oh well. I love the Sally Hansen Salon Effects and so that's what you are seeing today! These are the Patch-o-Lantern patterns. I was not impressed with these, I again had shrinkage on the tips. What you see in the pictures is only after 2 days of wear. They also tore very easily when I was taking them off of the plastic. I added a layer of Northern Lights for a little sparkle. Enjoy! 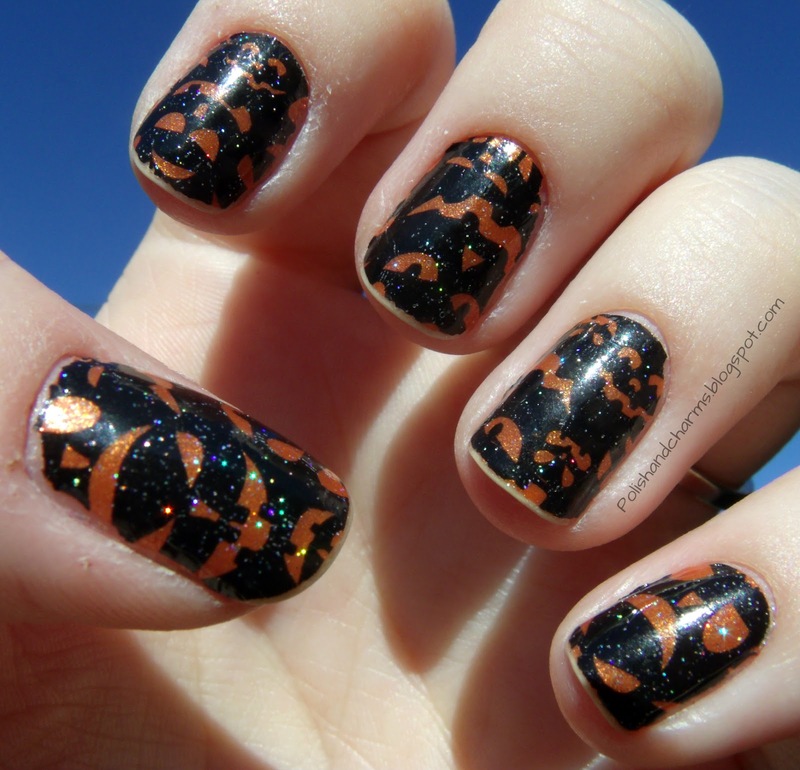 Don't forget to stop by the other Twinsies blogs and see their Halloween manicures! Awww, bummer about the shrinkage! The pattern is super cute! It's fun and pretty, the colors and micro glitter work well together! Lol, nice "cheat." Weird about the shrinkage though...I've never seen that before with these strips. So cute! I LOVE the glitter topcoat you added! OHHh! I love this too! Cute design! I haven't tried the Sally Hansen decals yet but I've been meaning to! I know, I am wondering if they have been slacking off on making them. Yea, I don't know what the deal is with these. Hehe! I know, but I was dying to wear them! This has happened to me twice now with these strips. I loved the added sparkle. I don't know what the deal is with these. I think so too! I hate shrinkage! I love how you added Northern Lights! Very cute look overall, even if they are a pain to apply!